Customer Service Delivery taps into business, marketing, and psychological research and practices to provide a wealth of knowledge about customer service. With contributions from some of the best-known industrial and organizational psychology experts in customer service, this book brings together in one comprehensive resource a review of the best practices in customer service delivery. Customer Service Delivery also provides a framework for customer service as a process and an outcome. The authors address a wide range of topics that are crucial to today’s competitive business environment: customer expectations, loyalty satisfaction, product versus service delivery, measurement, brand equity, regional and cultural differences, and organizational impact. 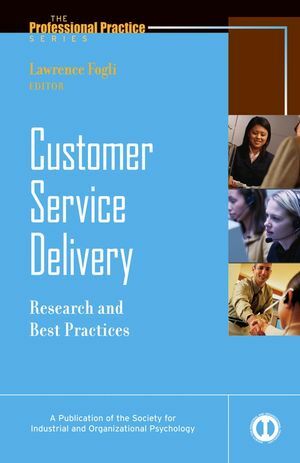 Customer Service Delivery explores human resource staffing practices and service delivery by including proven selection strategies for hiring top quality service workers, an analysis of the personality correlates of service performance, and a comprehensive review of assessment instruments that predict customer service performance. In addition, this important resource contains strategies and tactics to improve and manage service delivery and offers illustrative case examples of how organizations have successfully improved and managed customer service. Lawrence Fogli is a former corporate executive, vice president of human resource activities, and external consultant. He is the creator of ServiceFirst, a test designed to help with the hiring of service-oriented employees, and the developer of the Sales and Service Excellence System. Part One: What Is Customer Service? 1. Customer Service from the Customer’s Perspective (Stephanie D. Kendall). 2. Organizing for Customer Service (Robert J. Vance). 3. Using Employee and Customer Perspectives to Improve Organizational Performance (Scott M. Brooks, Jack W. Wiley, Emily L. Hause). 4. Brands, Expectations, and Experience (Clifton Lemon). Part Two: Employees and Customer Service. 5. Customer Service Quality: Selecting Valued Performers (Jerard F. Kehoe, David N. Dickter). 6. Staffing and Selection Strategies for Service Quality (Deborah L. Whetzel, Michael A. McDaniel). Part Three: Organizational Change Management for Service Quality. 7. Service Encounter Dynamics: Strategies and Tips for Better Customer Service (Diane Catanzaro, Eduardo Salas). 8. “This Call May Be Monitored”: Performance Management for Service Quality (Seymour Adler, Miriam T. Nelson). 9. What We Need to Know to Develop Strategies and Tactics to Improve Service Delivery (Lawrence Fogli).